Art collectors have unearthed two never-before-seen paintings by Kurt Cobain to display at the Seattle Art Fair this summer (17). Bosses at the United Talent Agency (UTA) will show pieces crafted by the late Nirvana musician at the upcoming event as part of a UTA Artist Space exhibit. Cobain's two paintings have been out of sight for over 20 years - the works were locked away in storage after the rocker tragically died at 27 in 1994. Grunge icon Kurt's paintings, which have never been displayed in public before, will also be shown alongside a selection of his notebooks at the creative gathering. One of the canvasses to be put on view was used as the cover art for Nirvana's 1992 compilation album Incesticide. The rocker's artworks will be on display among works by other noteworthy artists such as Mike Kelley, Joe Bradley, Nate Lowman, Elizabeth Peyton and Raymond Pettibon at the Seattle Art Fair, which takes place from 3 to 6 August (17). 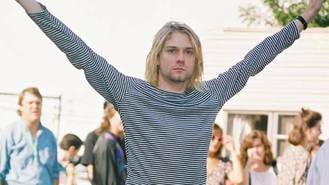 However, fans outside of Washington state may have the opportunity to see Cobain's work in-person at other venues, with The New York Times reporting his exhibition in Seattle may lead to more showings thanks to a developing partnership between UTA executives and the rocker's widow Courtney Love. Joshua Roth, the head of UTA Fine Arts, says there has been talk about creating a "touring exhibition" of Kurt's art, which includes dozens of sculptures, illustrations and paintings the musician made before he died.